Shares of United Continental Holdings, Inc. UAL gained approximately 4.7% since the third-quarter earnings release on Oct 17, outperforming its industry’s 1.9% increase in the period. The company’s outlook for the fourth quarter also raises optimism. Passenger unit revenues are projected to increase 3-5% year over year. 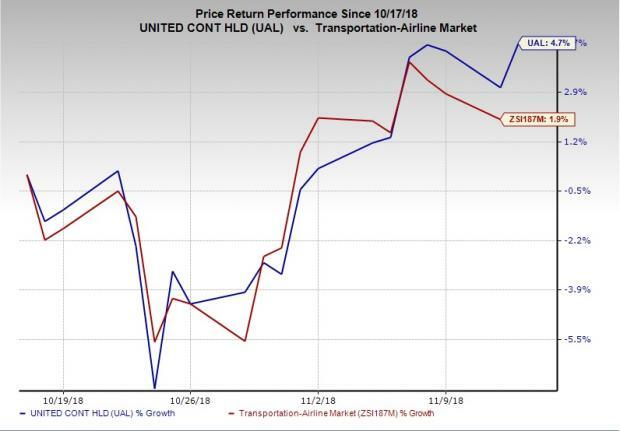 Additionally, United Continental predicts consolidated CASM — excluding third-party business expenses, fuel & profit sharing — to either remain flat or decline up to 1% year over year. The company’s global expansion initiatives are also encouraging. 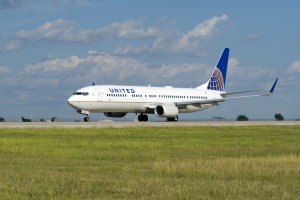 United Continental’s wholly owned subsidiary United Airlines recently submitted an application to the U.S. Department of Transportation, requesting for a second daily flight between New York/Newark Liberty and Shanghai Pudong. On approval, this service is expected to be effective June 2020 onward. Earlier, the carrier began operating non-stop flights connecting the San Francisco International Airport to the capital of Tahiti, Pape’ete. Moreover, the airline has decided to extend the current seasonal service between the destinations to a year-round one from Mar 30, 2019 onward. The carrier also announced its decision to operate a daily non-stop service throughout the year to Amsterdam. The flights are likely to be operational from Mar 30, 2019. With growing demand for air travel, the company’s strategic moves to expand operations in the key places are anticipated to attract traffic and in turn, boost revenues. Ushering in further good news United Airlines delivered encouraging traffic figures for October. Consolidated traffic, measured in revenue passenger miles (RPMs), was 19.41 billion, up 7.5% from the year-ago figure. On a year-over-year basis, consolidated capacity (or available seat miles/ASMs) rose 5.9% to 23.58 billion. Also, load factor (percentage of seats occupied by passengers) expanded 120 basis points (bps) to 82.3% as traffic was higher than capacity growth. At the end of the first 10 months of 2018, the carrier registered a 6.3% increase in RPMs to 192.6 billion while ASMs climbed 4.7% to 229.93 billion, both on a year-over-year basis. Thus, load factor inched up 130 bps to 83.8%. The company posted an on-time performance of 71.8% and a completion factor of 99.8% for the month. United Continental carries a Zacks Rank #3 (Hold). Some better-ranked stocks in the broader Transportation sector are Air France-KLM SA AFLYY, International Consolidated Airlines Group SA ICAGY and Spirit Airlines, Inc. SAVE, each sporting a Zacks Rank #1 (Strong Buy). You can see the complete list of today’s Zacks #1 Rank stocks here. Shares of Air France-KLM have rallied more than 28% in the past six months while the International Consolidated Airlines and Spirit Airlines stocks have gained more than 8% and 43%, respectively, in a year. More posts about United Continental Holdings, Inc.